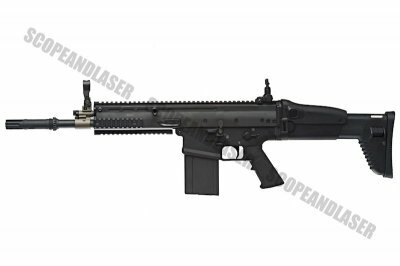 The Special Forces Combat Assault Rifle or SCAR, in Black and DE, is a modular rifle made by Fabrique Nationale de Herstal (FNH, of Belgium) for the U.S. Special Operations Command (SOCOM) to satisfy the requirements of the SCAR competition. This family of rifles consist of two main types. The Mk.16 SCAR-L (light) is chambered in the lighter 5.56x45mm NATO cartridge while the Mk.17 SCAR-H (heavy) fires the heavier 7.62x51mm NATO cartridge. While time has showed the SCAR to generally be cancelled for US forces, to some extent they are used in limited quantities. In particular, the Mk.17 is still being acquired for special operations where the reliable platform for the higher power 7.62mm proves more effective for long range fighting. With a shorter barrel, the Scar-H is purposed for fighting at shorter ranges such as urban areas. The preference of the heavier cartridge in this case being for superior stopping power, particularly at fringe stand off ranges. 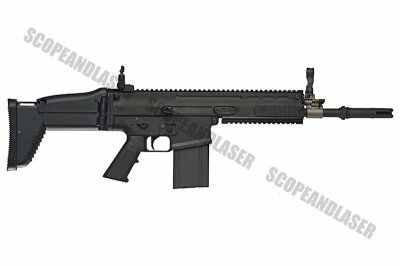 It is with this prowess that the Scar-H makes its début; of course in Airsoft it means no difference to performance other than the different magazine, at the very least many player prefer the aesthetics of the Scar-H over the Scar-L due to the more aggressive profile of the larger magazine hanging out of the receiver. As a truly modern weapon, it uses a polymer lower receiver, pistol grip and stock but the material used is incredibly strong and hard wearing. The upper receiver, short barrel and other details are rendered in metal with the CNC upper receiver itself being Aluminium (for a high strength to weight ratio), the barrel being steel giving it a nice genuine distribution of mass proportionally speaking. The stock is telescopically adjustable to 6 positions, the cheek rest is adjustable to 3 positions and the whole stock can be folded to the side for an even shorter overall weapon. 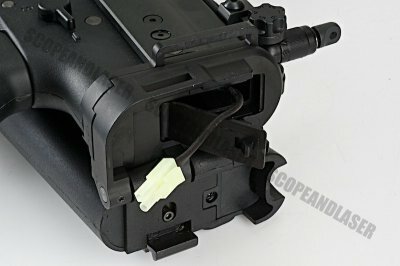 The battery is stored inside the receiver with the wiring so neatly hidden away that even with the stock folded none are visible. 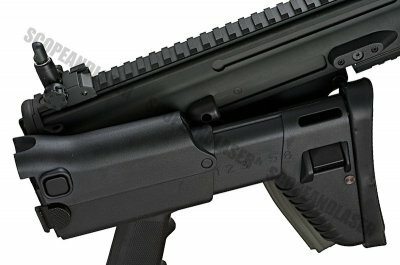 The bolt catch is on the left side but the fire selector and magazine release are truly ambidextrous being present on both sides. The weapon even uses the FN style magazine. The stock fits the mini type 7.4v Lipo or also smaller batteries with a battery compartment space which is relatively small. 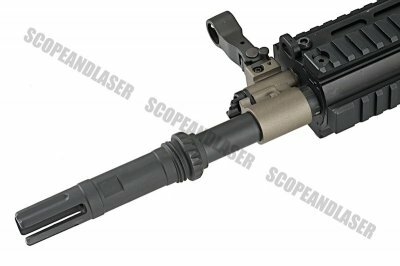 Modification potential is high which very handy as the stock power of 370 FPS is perfectly good for short range and indoor use some may wish to swap out the spring to ensure targets at longer range can still feel the firepower. It also features a quick change spring system which is very handy for those that want to switch from an outdoor to an indoor scenario game.